Introduction: When traveling light it is crucial to carry premium equipment. 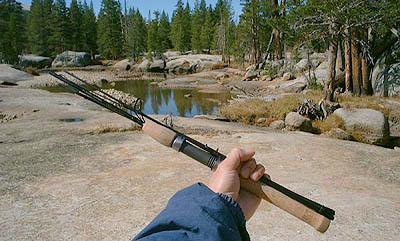 Packing a well-built light fishing rod is quite important to minimize any chances of failure on your adventures. The ultralight St. Croix Premier Traveler spinning rod is packed with performance and quality that won't let you down. We geared up the St. Croix Premier for our latest backcountry field test in the high countries of Yosemite National Park. Impressions: The St. Croix 4 piece travel rod is well protected in a small Cordura covered rod tube. This hardy rod tube will assure that when packed with your other travel gear, your premium spinning rod is still safe and sound. The actual rod breaks down to four pieces, making it possible to fit inside a smaller tube then most other manufacturers can offer. When the Premier Traveler is taken apart, each piece only stands 19 inches long. Being very lightweight and easily broken down to 4 short pieces, this rod makes a great choice for backpacking, traveling, or just stowing in the back of your car. Line Maxima Perfexion 2 lb. The St. Croix Premier Traveler spinning rod is made from their premium SCII graphite along with a select-grade cork handle, quality Fuji graphite reel seat, and 6 tough Hialoy eyelets on single foot guides. Real World Tests: Built to travel, the Premier Traveler by St. Croix went on rough backpacking trips with the TackleTour Editors to Yosemite National Park. 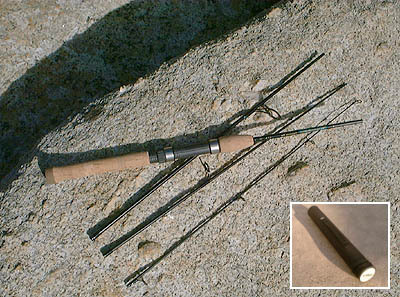 The tests for the PS60LF4 consisted of days trout fishing in the rivers and lakes at different elevations. At the same time the Premier Traveler battled many trout ranging from finger size to forearm lengths. When I was loading my backpack I found the Cordura rod tube to be a little on the heavy side to carry on miles and miles of hiking, especially when you want to pack and travel light. The rod tube is great to stuff into your luggage or the truck of your car, but for backpacking I opted to just rubber band the 4 pieces and placed them in the tent pole holder on the side of my pack. You must think I am crazy to put a $120 St. Croix rod on the side of my backpack without any protection. Well, I was confident that I wouldn't damage the rod, not because I am always baby my tackle, but the Premier Traveler is built using SCII graphite which is durable enough to take a good deal of beating without any signs of damage. Casting & Accuracy: Casting distance and feel of the Premier Traveler is excellent. This ultralight fast action spinning rod casts very easily and accurately. Casting lures like Panther Martins and Kalin's Trout tubes in the smallest sizes were made simple by the finely designed action and taper. Even though the St. Croix Premier Traveler is 4 different pieces, you won't notice any degradation in casting or accuracy. 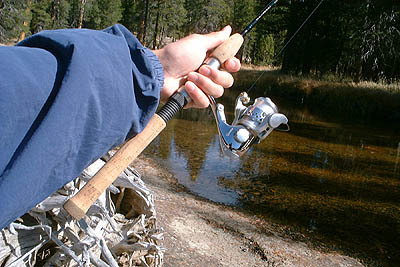 The 6 foot rod is actually a good length for the backcountry waters because when you work your way through the brush to your honey hole, you won't have to worry about breaking your rod on trees and other obstacles. Also at this length it makes casting easier when you have limited space. 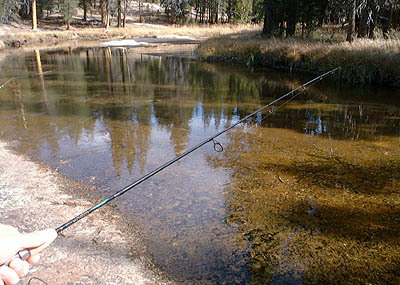 With a short flick you can get the lure to the desired location where the trout are holding. 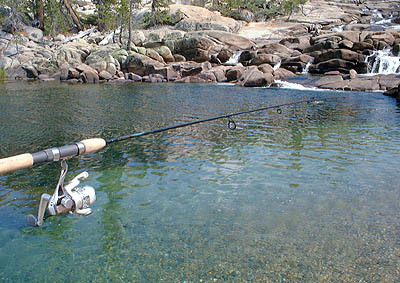 Casting the St. Croix rod all day trout fishing is quite nice because it puts almost no stress on your wrist and arm. The Premier Traveler is only 3.0 ounces in weight. Paired with an ultralight reel, you will be able to fish all day long. In addition, when high altitudes of 9000 feet gets cold, it's nice to hold onto quality cork instead of cheap foam material. This will help you feel more comfortable especially when fishing in the winter months when foam grips dry much slower and can be very cold when wet. Sensitivity: If you have lure fished for trout before you know they don't just nibble at your spinner or spoon. They hit it hard and then run! You will be able to tell everytime you get bit. We wanted to know just how sensitive the St. Croix Premier Traveler was in a range of situations. The rod is 4 pieces, so how does that affect the sensitivity of the entire rod? Well, after many backpacking trips throughout the entire summer even the tiny 3 to 4 inchers that hit my lures are easy to detect. The PS60LF4 is actually quite good in this category. The slim ultralight plus the fast action of the rod helps transfer the vibrations you get from tiny bites. Also, the single foot guide frame also assists in increasing sensitivity. Not to go into too much physics and the transmission of sound waves, let's just say having one wrap (attaching the guide frame to the rod) makes a rod more sensitive than having two. Power: The St. Croix Premier Traveler casts surprisingly well and is quite sensitive, but how does it pair up against trout that fight and jump all the way in? Throughout the backpacking trips I hooked many small to larger trout that came in easily and some that were aggressive and wouldn't give up, running downstream and into structure. By using 2 lb. test I wouldn't muscle in the fish as I would while bass fishing. The drag of the reel along with the Premier Traveler functioned nicely together leading to my successful battles with the larger monsters. The ultralight rod also makes fighting these backcountry trout exciting. To further test the power of the PS60LF4 I took a side trip in the summer to a lake known for huge trout that have incredible fighting-power. Crowley Lake in the Eastern Sierras of California holds some real monsters, especially during trophy season. Knowing this I upped my line to 6 lb. test and began my tests. The St. Croix rod demonstrated it's power along with quality material and thoughtful design, especially when I hooked some 22 inchers that made me do circles in my float tube. Conclusion: St. Croix rods have been known for many years of being a premium manufacturer that shows its quality and performance in many different ways. The 4 piece Premier Traveler in the ultralight category demonstrated its abilities to be able to not just handle the stress of multiple backpacking trips in the high elevations, but also while battling small to monster sized trout throughout the Sierras. The casting, sensitivity, and power show no signs of weakness throughout our field tests. The ability to be able to break down a quality spinning rod and pack it to go will assure you won't leave home without one of the best. I strongly welcome this rod on my future adventures, and I would recommend you to include the St. Croix Premier Traveler in your itinerary.